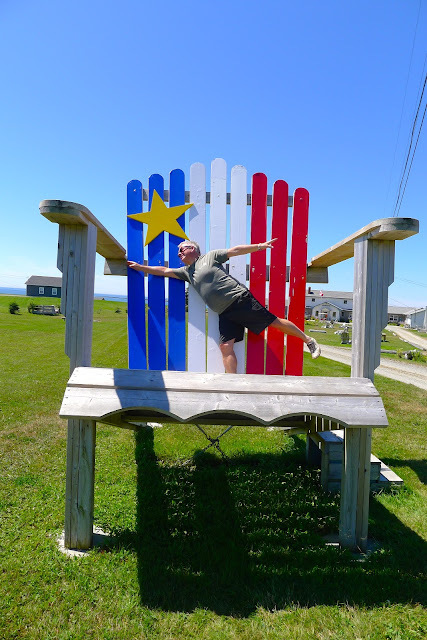 Acadian pride runs high in this part of the world. Flags fly everywhere. French is spoken everywhere. People are friendly everywhere. Illegal drinking on Mavillette Beach. I sure had a hard time saying good-bye to this beauty. We have driven up and down the French Shore many times this week. Every time we do, I see something new. Thank goodness Joe humours his crazy photo-taking wife and pulls over whenever I shriek, "PULL OVER!" Such a good husband. The architecture in these parts is so different from the west coast. The houses that dot the coastline are beautiful and so full of character. But it is the weather-beaten homes that interest me. Many of them are abandoned. And many of them look abandoned but surprisingly are not. 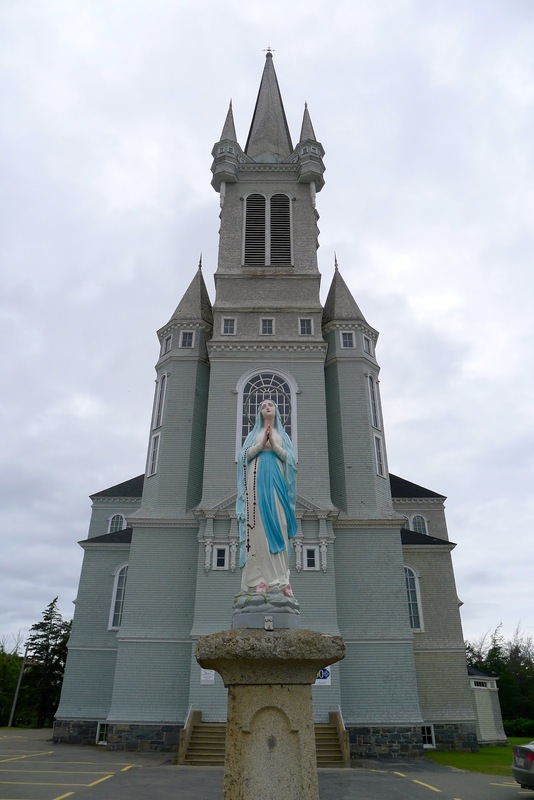 We've been keeping busy exploring the little villages that run up and down Baie Sainte-Marie. 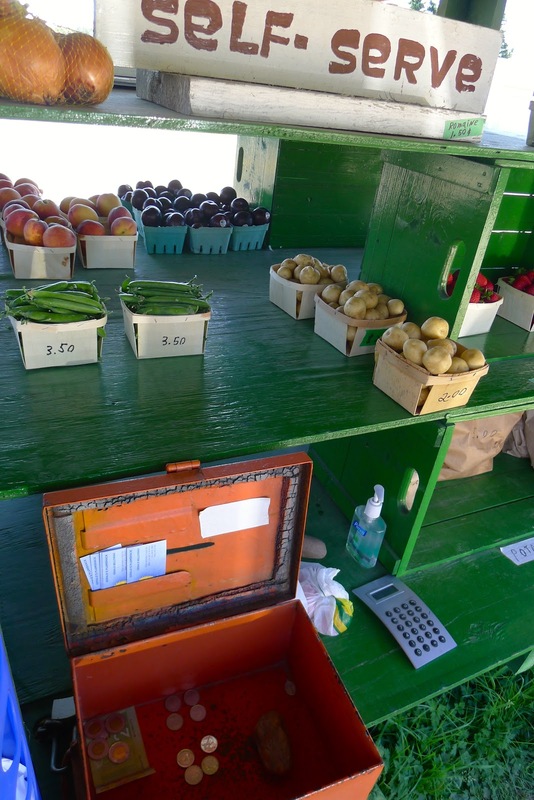 So many of these self-serve produce stands dot the roadways. Complete with an unsupervised cash box. Sainte-Marie Church. Largest wooden church in North America! On Sunday afternoon we joined all the people at Sacre Coeur Church's picnic. There is nothing better than eating 'rapure' in a church hall basement on a rainy Sunday afternoon. The lily pond at day break. Taking in all that is Baie Sainte-Marie. Taking a break from walking along the shingle of Belliveau Cove. The present day Petite Chappelle (the interior is only about 8 square feet) was built in 1892 to replace an even smaller chapel. Once during a very high tide and storm surge it floated away, but don't worry. It was rescued. Canada geese in the estuary. I swear, the cemeteries in both Ireland and Nova Scotia have the best views! The 'Festival Acadien de Clare's' children's parade was on Monday afternoon. The police blocked off the highway but everyone marched on the sidewalk just to be safe. Having some fun on the giant adirondack chair at the Ocean View Motel. I would love to grab a dozen friends and sit on these chairs. The rocks at Cape St. Mary's lighthouse. Each and every household has its washing on the line on sunny days. What a charming sight. And that, my friends, is what we've been up to the for the past few days. Tonight we're heading out to a wine tasting event with Nova Scotian wines. Who knew Nova Scotia made wine? Certainly not me! I'll let you know how it goes.